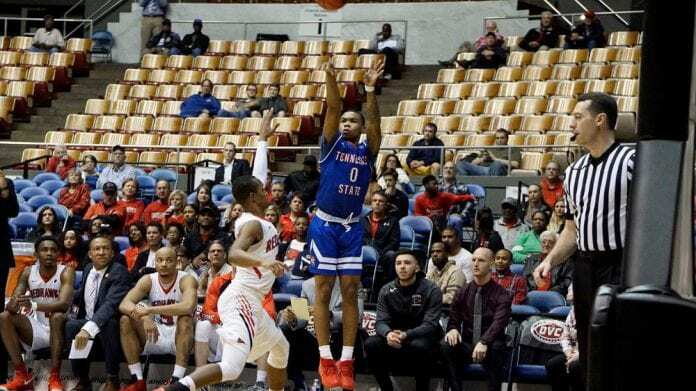 A once promising season ended prematurely Wednesday night for Tennessee State University, as the Tigers blew a six-point halftime lead and were edged 78-75 in overtime by Southeast Missouri in the opening round of the Ohio Valley Conference Tournament at Municipal Auditorium. Tahj Eddy hit a dramatic game-winning three-pointer with less than three seconds remaining (2.2) to give SEMO ;the win. That negated the tying three-pointer hit by Ken’Darrius Hamilton with 7.2 seconds and ended any hopes the Tigers had of continuing their season and maybe even getting a third shot at regular season champion Belmont. The Tigers were led by Wayne Martin with 19 points and eight rebounds. Armani Chaney had 14, Tahjere McCall 12 and Hamilton 10. TSU did many things right, including dominating SEMO on the backboards with a 49-30 rebounding advantage, and holding them to 35 percent shooting. They also shot over 50 percent in the first half while limiting SEMO to 28 points. But they went cold from the field in the second half and overtime, especially from the three-point line. The Tigers made only five of 20 three-pointers for the night. SEMO wasn’t much better from that range, but did make nine of 28. TSU had a strong stretch early in the second half that put them ahead 48-39 with 11 minutes remaining in regulation. But from that point on and including the overtime, the Tigers could only score 27 points. SEMO’s press forced some key turnovers, and there was also some questionable shot selection down the stretch. Even with all those problems, the Tigers were up 58-54 with four minutes left, but weren’t able to su stain the pace and were fortunate to get the game tied at 64-64 when Chaney hit two free throws. They quickly got behind in overtime, but rallied to get within two points at 72-70 with 27.5 seconds remaining. But ultimately Eddy’s three-pointer gave SEMO the hard fought victory, although Denzel Mahoney led not only SEMO but all scorers with 34 points. The Tigers finished the year at 17-13, but may still be invited to a postseason tournament. SEMO advanced to face Jacksonville State in the next round of the OVC Thursday.